The McCook County 4-H team participated in the 63rd Annual National Land and Range Judging Contest in Oklahoma City. South Dakota's McCook County 4-H team participated in the 63rd Annual National Land and Range Judging Contest in Oklahoma City. The group competed in the nation's top land judging event at a site near Mustang, Oklahoma. Members of the McCook County 4-H team tested their individual and team skills against other land judging teams from 34 states by evaluating land characteristics like topsoil, subsoil, slope, and plant life. They were also required to recommend treatment to improve the land's adaptability for certain purposes like producing crops, raising cattle or building homes. 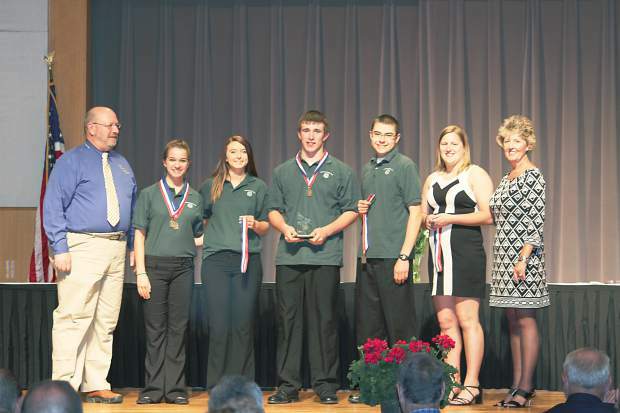 In the 4-H competition of Land Judging, The McCook County 4-H team from South Dakota received fifth place. Individually, Julia Loudenburg received fifth place overall, Kylar Hansen received 14th place overall, Andrew Streff received 38th place overall and Taylor Johnson received 44th place overall. The McCook County 4-H team also participated in Homesite Evaluation contest. As a team they placed 10th. Individual placings were Julia Loudenburg receiving 16th place overall, Taylor Johnson receiving 25th place overall, Kylar Hansen receiving 31st place overall, and Andrew Streff receiving 41st place overall. In Range Judging, David Ollila, SDSU Extension Sheep Field Specialist from South Dakota was the adult contest winner.